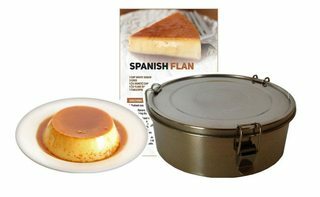 What is a flan pan called? I love making (Filipino) leche flan for my wife and I. However, I use a 9" round cake pan that I wedge into a 9"x13" cake pan, which I fill with water until it just touches the bottom of the cake pan. I then sprinkle a bit of cinnamon into the water, pour my flan mix (10 egg yolks, 1 can condensed milk, 1 can evaporated milk, dash of vanilla) into the round cake pan, and cover with aluminum foil to create a sort of rudimentary bain marie. I then pop this into the oven for 30 to 40 minutes. My question though is: is there a pan specifically for making flan? If so, what is it called? My way creates a very top heavy and unstable (water sloshing) platform - and I'm afraid I might one day spill hot water on myself - not to mention that getting the round cake pan out of the rectangular cake pan is a pain. It doesn't appear to be intended for use with a bain marie, I'm pretty sure it's intended to eliminate any need for a bain marie (although I have never used one for flan). Not the answer you're looking for? Browse other questions tagged dessert pan flan or ask your own question. How do you make the sauce that is underneath Flan? How to customize the softness of custards like flan? What is this pan called, and what is it used for? What pan can be subsituted for a Paella pan? I made a flan, added lime zest and grated ginger, and it was a flop. What is happening? How do I distribute fillings evenly in flan/pudding mix?